CloudMagic (Android) - The fastest way to search your Google and Twitter accounts ~ Android Forever! Search across Twitter, Gmail, Google Apps, Docs, Calendar and Contacts from desktop or mobile. 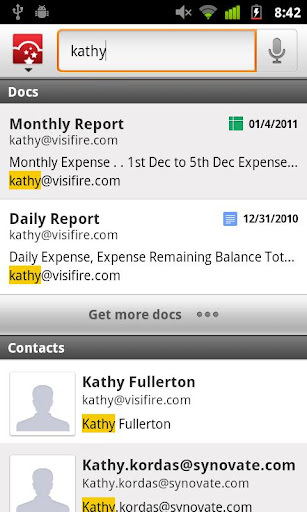 - Lists relevant tweets, emails, docs, calendar events and contacts instantly as you type. Saves hours each week. - Search across all your Gmail, Google Apps and Twitter accounts in a single place. - Allows you to quickly preview and take common actions like Reply, Retweet, etc. - You can find the right tweet, email, doc, calendar event or contact even if you know just the first few letters of what you are looking for. CloudMagic is FREE on the Android Market!